My alarm goes off at 3.30am, but I’ve already been lying in the dark for an hour waiting to hear it ring. I get up and check my backpack – passport, camera, notebook, various permissions, tickets. I check my phone a few times to see if maybe, by some miracle, the refugee crisis has been resolved overnight and my editor is telling me I don’t need to go to Lesvos today. There is no such email, so I write a good luck note for my son who is starting preschool that morning, tape it to the bathroom mirror and leave for the airport. The flight to Lesvos is short, there’s only enough time to quickly gulp down a cup of coffee before our descent begins. I’ve worried about what I’ll see as I come in to land, but at 6 am, it’s still dark. Dawn is only just starting to prick the horizon, and with it I see three newly arrived boats on the way from Mytilene to Molyvos. The boats must have arrived a few minutes ago. The occupants sit on the shore, checking their smartphones as tire inner tubes bob on the calm, black sea. I am in the epicentre of Europe’s refugee crisis. At its shortest point, the distance between Lesvos and Turkey is just 6 kilometers across and dozens of boats have been rushing to make the journey this summer. Thousands have died along the way. The rest of Europe has recently got a taste of what this small Greek outpost has been dealing with for the last few months. While the front end of the refugee column reached the rest of Europe this summer, the tail end keeps on growing and shows no sign of slowing down. Just a few days ago, violent protests broke out on the island between refugees at their wit’s end and riot police trying to contain them. The islanders were caught in between – TV images showed them in tears and afraid, not quite believing what was happening on their island that was simply a quiet place to have a holiday before any of this began. The violent episodes at the start of the week were a culmination of months of inaction by the Greek government, unprecedented numbers of refugees fleeing increasingly violent wars in Syria and elsewhere. Within days, the backlog of some 20,000 refugees had been cleared and moved onward to Athens on boats specially charted by the Greek government. I walk down to the small port and scramble over the rocks on the breakwater where I see my first piles of lifejackets and abandoned dinghies. Not knowing how much worse the images will get later, I take pictures. I’ve been to Molyvos before any of this started, one hot summer when I had just found out I was pregnant with my first son. Later in the day, as I drive past places I’ve visited on holiday, the contrast is jarring. 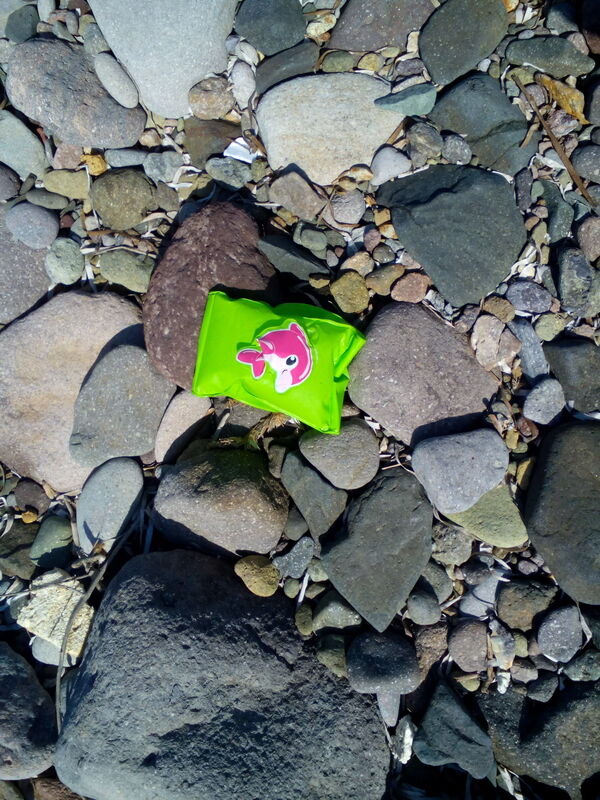 A child’s armband on a beach near Eftalou. This is a place where life has been turned upside down. One third of the population on the island itself traces its roots back to refugees fleeing the Smyrna disaster of 1922. Yet those who have had enough of today’s crisis don’t hide it. This is news to 23 year old Kirsten from the Netherlands. She is one of the rota of volunteers that watches for arriving dinghies through a newly formed Dutch NGO, the Boat Refugee Foundation. Together with local couple Eric and Philippa Kempson, who form the backbone of Molyvos’ relief effort, they watch across the day for arriving dinghies which they meet with water, clothes and sanitary items. “I came here because I was watching the images on television and wanted to help. It feels really good to be here.” Kirsten says. She gave up three weeks of her personal summer holiday to fly to Lesvos and help the situation. There is no shortage of things for her and the other volunteers to do. Eric says that just a few days ago, 40 boats arrived in a single afternoon. As the smugglers on the other side of the channel reap the benefits of human desperation, the boats keep coming in an endless flow. In Eftalou where Eric and Philippa live, the beach where refugees land is walking distance from their house. Nothing was being done, so they decided to step in. Not all that rarely, locals harass them for helping the refugees. In a past life they were known for their olive wood workshop which still operates from their house nestled amidst an olive grove. Outside, boxes of donations from across Europe wait to be sorted. I spend some time watching the volunteers and then head north to try and meet one of three boats they’ve spotted. I get lost and miss it, so I backtrack to Eftalou and find I’ve missed the second one too. Down on the beach, I see a photographer with a long range lens. The island is full of journalists. Everyone wants to get this story onto their CV, myself included. A man fishing looks at me “Marhaba!” he shouts. “I don’t speak Arabic” I say in Greek. “Oh? You look Arab.” We chat for a while and he tells me about a fight as the boat landed between the refugees and a man trying to take their outboard engine. I ask him if the dirt road will take me to Mytilene “It will, but it’s a rough drive. Then again I saw you bomb down this hill with that little car of yours. You should be okay.” A few hours into the story my car is already covered in dust both inside and out. I set off. 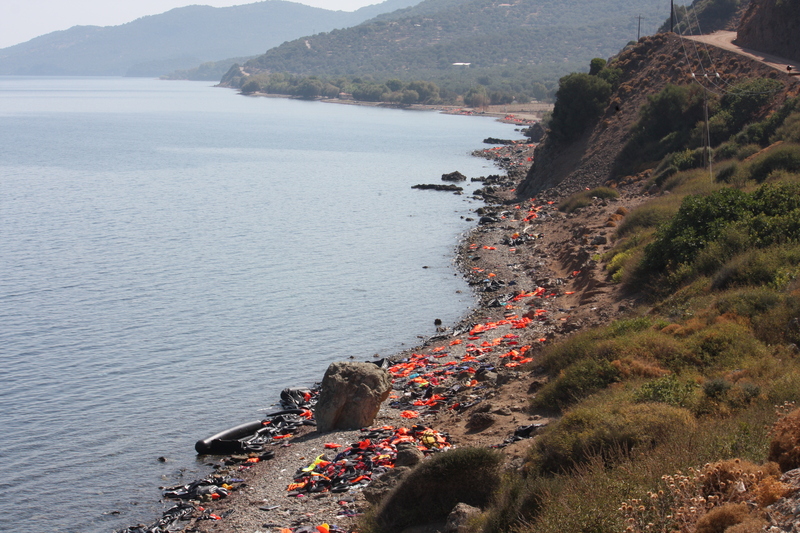 On the road from Molyvos to Mytilene, the capital of Lesvos, enormous piles of fluorescent orange lifejackets, deflated dinghies and tire tubes litter every beach. In some places, the pebbles disappear altogether under the sheer volume of discarded materials and locals pick their way through the detritus for their daily swim. Scavengers waste no time in taking anything valuable, sometimes trying to rip away outboard engines from dinghies before they have reached shore. I see all the places we visited on holiday, except now the beaches we swam on are peppered with lifejackets and the trees we relaxed under are posted with signs in Arabic and illustrations asking people not to litter. The beautiful beaches on the east coast are all but unusable from a tourist’s point of view. It’s clear on this drive, which takes me over an hour, that the refugee crisis is going to leave its mark on Lesvos for a long time. Even if the means to do so were available, the effort to clean up all the junk left on the beaches and roads of the island will be superhuman. In the old Town Hall of Mytilene, Marios Andriotis, Press Officer to the Mayor looks like a man well within his rights to say “I told you so” about what happened earlier in the week and what’s been happening on the island for years. He says their office never turns down an interview in an effort to highlight what they were facing. Indeed, if you follow the coverage across the months, it’s clear that the mayor, Spyros Galinos’ pleas were becoming increasingly frantic. “We’ve been facing the refugee crisis for a few years now but at the end of January this year the numbers really went up, from around 600 a day in March to 1,500 a day by July. As we saw the numbers going up, we tried to raise the profile of this issue. We asked the central government for help to no avail. Andriotis said that in the last two months, the number of refugees passing through Lesvos surpassed 90,000, more than the population of the island itself. “Locals are seeing everything we do for the refugees and ask “What about us?” They’re within their rights to ask that, because this is taxpayer’s money we’ve spent on the issue, around EUR 400,000 so far. That came from our own municipality funds.” The municipality has applied for the amount to be reimbursed by the central government and by Europe, but they’re not holding their breath. 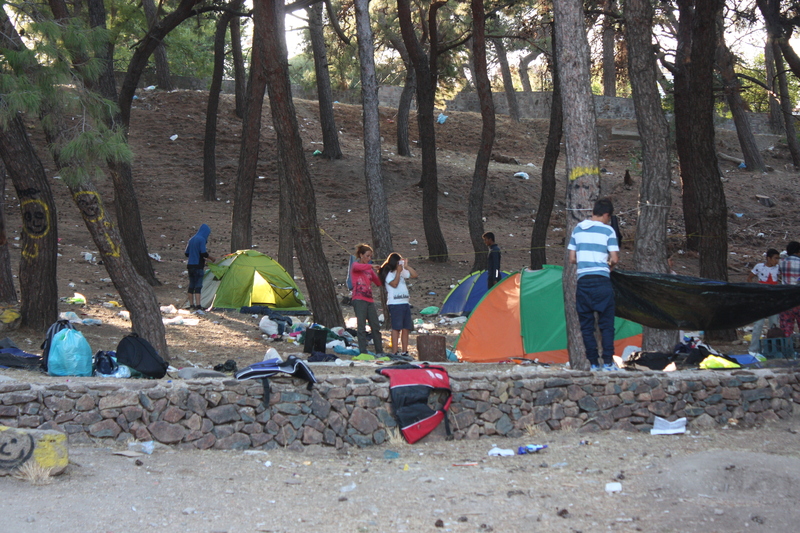 In Mytilene town itself, the tent village has all but disappeared. What remains are the odours of a public space with no facilities that was used by too many people for too long and a sense that the conditions won’t last. 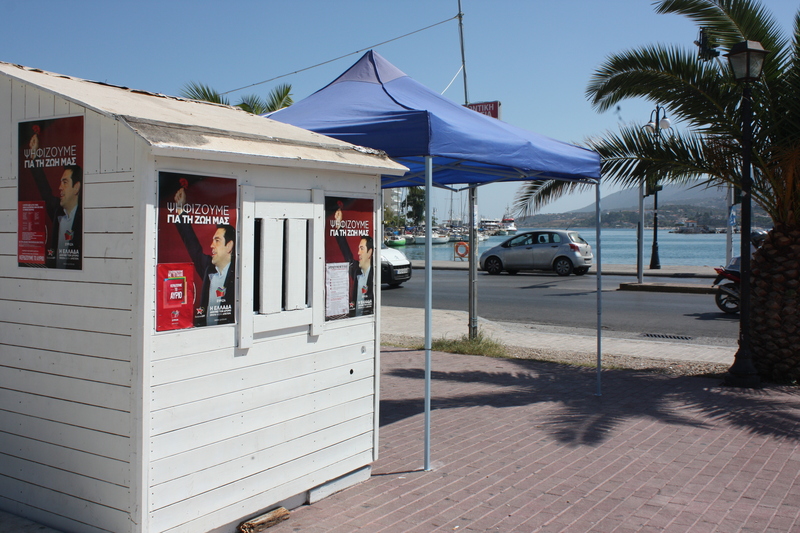 Syriza election posters in the port. Many think the cleanup operation will come to an end after the elections. I remind him of the 1922 Smyrna disaster, when the Greek population of what is today Izmir was systematically slaughtered by an advancing Turkish army. The violence was on an unimaginable scale, and hundreds of thousands fled for their lives. Among them was my husband’s grandfather, born on a school floor in a village in Lesvos three days after fleeing Smyrna on one of the last boats. My mother in law has told me stories of how her grandfather, my husband’s great grandfather, eventually settled in Larissa and would now and then go to watch Turkish movies with fellow Smyrna survivors. Later, he would be so homesick he wouldn’t talk for days. “Those people ran for their lives. That’s not cowardly.” I say. “Who ran? Who left Smyrna? We stayed. We fought.” he replies. I give up and force myself to be polite as I leave. Luckily not all the islanders feel this way, though given what they’ve put up with, no one could begrudge them for having lost patience. At a nearby coffee shop I ask the man making my frappe whether he thinks the cleanup is just for the elections. “I don’t know. I hope not. These poor people have been through enough. They just want to move on.” he says. Djamal Zamou, UNHCR’s emergency coordinator, said that their initial response was advisory until the situation became as complex as it did. “When we realised three or four weeks ago that the authorities didn’t have the capacity to deal with the numbers which kept growing, we decided to offer practical help. “We are working in partnership with various bodies to provide shelter, food and registration assistance. At one such camp, Kara Tepe, a few kilometers outside Mytilini, Syrian refugees wait to get papers to travel onwards to Athens. The camp is almost empty now, but the heavily littered grounds betray the gigantic scale of the problem that built up over months when a camp built for 600 people hosted over 3,000. To get some idea of the problem, you need only to travel down the road to Moria, where the camp for non Syrian refugees is. I don’t have permission to visit Moria unaccompanied but I end up doing so by accident when I drive an Afghan family there. They speak no English but their surprise is evident in their tone of voice. “Camp?” they ask me uncertainly, as if trying to make sure I didn’t misunderstand where they had wanted to go. Have I taken them to some sort of dump by accident maybe? “Yes, camp.” I reply. Enormous black nets normally used for collecting olives are spread out everywhere for shade, trucks and canteens do a brisk trade in fruit, water and tents and hundreds of refugees stream to the registration desk. The mess is incredible, so is the noise. Suddenly the group spot some people they know and seem visibly reassured as they get out of the car. As they leave, they pick off the little twigs and leaves their shoes have left on the carpet of the car. Having had their company for over an hour and listened to the little girl’s singing in the backseat, I feel crestfallen to be alone again. Compared to the level of chaos at Moria, which goes hand in hand with the complaints of Afghan refugees that Syrians are getting preferential treatment, Kara Tepe is relatively peaceful. A fashionably dressed young woman sits on a chair in the shade, pouting and looking both impatient and wildly out of place. Her blonde-streaked hair is carefully styled under a bandana. “No photos” she says grumpily. In becoming a migrant or a refugee, part of your identity gets lost. She has fiercly held on to hers. I’d like to see anyone try and take it judging from her attitude. Nearby Laleh, 18 years old takes a break for a dinner of chicken and rice provided by the International Red Cross. “I arrived in Greece this morning. It was very dangerous, I was very scared. There is a lot of racism in Turkey against Kurds. The smugglers took us inside a small vehicle. We couldn’t breathe and I cried the whole time.” She and her family are Syrian Kurds from Aleppo. Having survived the crossing, she is optimistic about her future. “I will go to Holland where my aunt lives. And one day I will go back to Syria. Syria was paradise.” This isn’t the saddest story I’ve heard, but in this moment the utter stupidity of humans catches up with me and I start to cry. Laleh and her mother tut and pat my back. “It’s okay.” they say. When I manage to stop crying I give Laleh my number and ask her to send me a message when she gets to where she wants to be. I stand up, look around and start crying all over again. The sun has started to set by now and I take an aimless drive back up the east coast. As the roads grow smaller, my tiredness catches up with me and I start going down gears when I should be going up and slicing past other vehicles. In the twilight and empty roads I begin to feel like I’m lost at the edge of the world, millions of miles from home. I head back to the port. A small tent city has remained in the hills near the port. Mostly Afghans without the money for the EUR 60 ticket off the island stay here. Despite the smell, you can still detect the perfume of the pine trees in the evening. Lesvos is a very beautiful island and its natural scenery is breathtaking. It’s easy to forget that. A mother brushes her daugher’s hair in a tent camp near the port where mostly Afghans stay. Back at the port, I see a family I saw earlier in the day in the fading light. There are four children. The youngest two, including a baby around five months old with a badly sunburnt face are asleep on a sleeping bag laid on the floor. Here the tent city is gone, but the stench of urine has remained. A local man tells me that the high metal fencing around the port was only put up 10 days ago. I walk around the side streets near the ports, not sure what I’m looking for. Through an open door I can hear Alexis Tsipras talking on television and I think of Marios Andriotis and the effort he told me Mytilene had made to try and get the central government to listen to them. It’s no wonder Tsipras hasn’t come here to see things for himself. From my car, I call Tyler Jump of the International Rescue Committee for my final interview. He says he got involved in the Greek refugee situation after being active in Italy and hearing there about how bad it was in Greece. 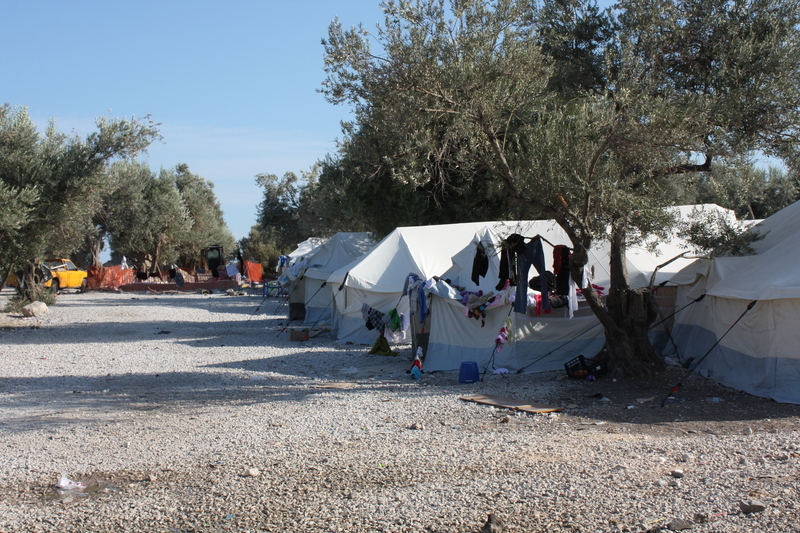 The IRC has helped with measures such as the buses which now take refugees from Molyvos to Mytilene, gravel on the floors of Kara Tepe camp, showers, water points and registrations. 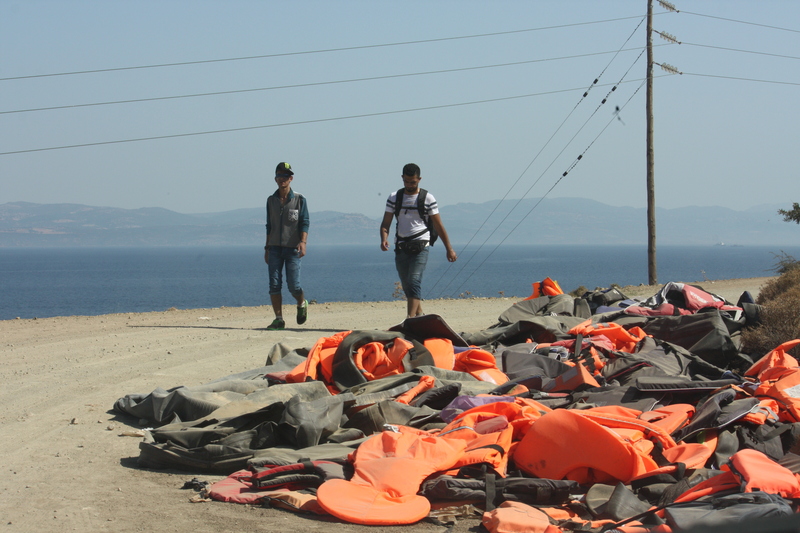 He’s worked in the Philippines and Ukraine, and what he saw in Lesvos shocked him. I ask him about the feeling that Afghan refugees I spoke to in Athens had about being discriminated against, and the fact that while Kara Tepe is nearly empty, Moria was overflowing with non Syrian arrivals. “There is a separate registration process for Syrians and a different one for everyone else. That’s something the authorities decided.” he says. It’s dark by now and I’m starting to falter after so many hours on the go so I grab dinner with a friend who has kept me company for part of the afternoon and head to the airport. In the line waiting to clear security in Mytilene’s small airport I can hear tourists and NGOs chat to each other. It’s the last flight of the day and well past 10 pm – small children have grown cranky in their parent’s arms. Thinking of all the journey weary children I’ve seen that day, some of whom are sleeping in the filth and stench of the port at that moment, tears roll down my face. My long day has come to an end. For thousands of others, there is no end in sight. 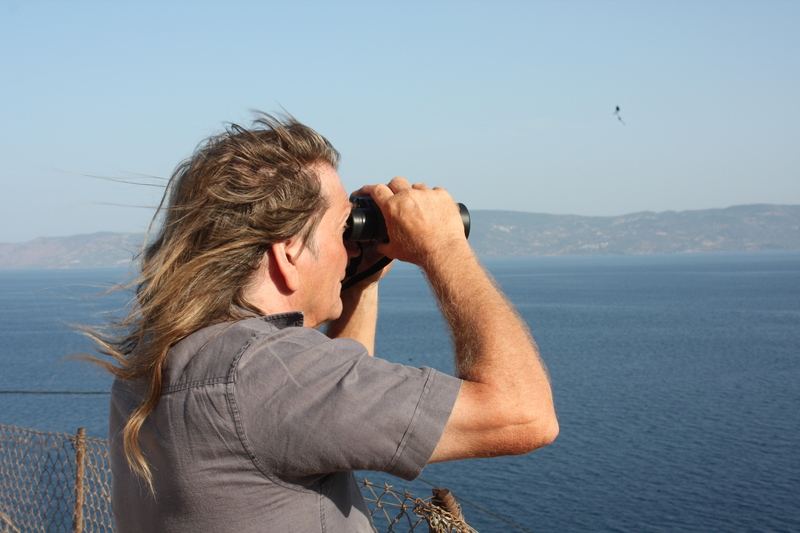 I get on a plane and leave Lesvos behind – it’s an almost laughably easy journey. The article that resulted from this trip appears here. The sadness of the whole situation is so overwhelming for everyone involved. Your trip sounds heartbreaking. On Rhodes we haven’t seen the numbers that the other islands have despite having larger numbers of officials who could have helped the smaller islands. It seems as if each municipality is guarding its own resources. Many locals are scared of the refugees. At our centre yesterday a group of volunteers were cleaning up. We were told it was useless, if we make it too nice we will attract more refugees and they come from filth over there anyway! They seem afraid that too many will come and they will want to stay. This week also saw the first Red Cross packs arrive. So far everything the refugees have been given from clothes to toothpaste comes from donations and volunteers. The locals think that the refugees will stop now summer is ending I’m afraid things will get worse.